Lasers have become very popular means of skin rejuvenation. All the laser treatments are very quick and involve no to minimum downtime. These are very safe techniques as we only use FDA approved lasers at Sakhiya Skin Clinic. 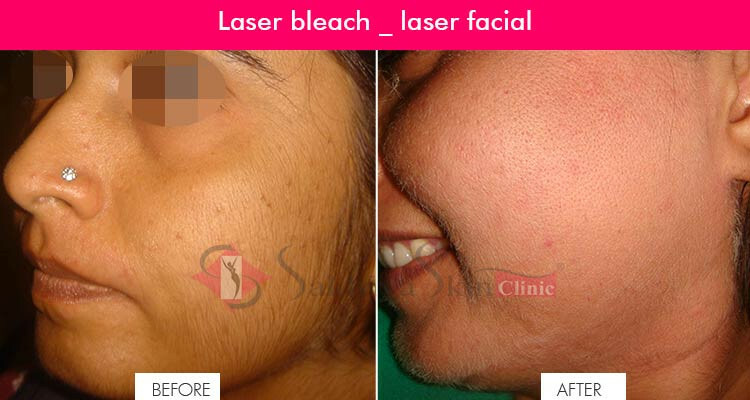 Laser bleach is a process used for skin lightening or skin whitening. In this technique, pigmented areas of the skin (after being treated from Q-switch technique) are further treated so as to match the affected portion of the skin with the surrounding area. This world-class method can effectively reduce fine lines, wrinkles, pores or mole sizes and improve skin texture. Laser facial is another treatment for eliminating damage done by the sun on our skin, dark spots, acne, freckles and all other skin imperfections. It helps in minimising all these skin problems from the core. Laser facial can be ablative or non ablative depending on the choice and need of individual patient. Laser bleach and laser facial both work on the principle of ‘Skin Lightening’. Both methods use laser light for skin resurfacing and try to mitigate the skin imperfection by removing the excess of melanin left out. The process uses either continuous or pulses of visible light. The light is then released onto the skin allowing it to rejuvenate. People undergoing laser bleach and laser facial treatments are assured of having safe, reliable and convenient cosmetic treatments. These methods are used in conjunction with the medicines prescribed. WHAT ARE the BENEFITS OF LASER FACIAL & LASER BLEACH? It is a fast & effective treatment, which results in overall improvement in the appearance of the skin and improves your complexion & confidence. WHO CAN OPT FOR LASER BLEACH? People with uneven skin tone, dark spots, tanned skin and normal skin can opt for laser bleach treatment. WHICH IS THE TREATMENT FOR FACE GLOW? Q-switch laser is the treatment for skin lightening & face glow. Light is passed all over the face and absorbed by the skin tissues. Then, the body defense mechanism rejuvenates the skin by decreasing melanin & stimulating collagen resulting in youthful & rejuvenated bright glowing skin. I DO NOT WANT ANY REDNESS POST PROCEDURE & WANT INSTANT RESULTS. CAN I GET LASER FACIAL DONE? The process is ideal for patients with active lifestyles because the procedure requires no downtime, no redness and has a low risk of side effects. I WISH FOR LIGHTENING OF MY SKIN TONE. WILL THIS WORK? Yes! Laser skin lightening is a fast, effective & safe method in which laser reduces melanin pigment in the skin & aims at achieving a lighter skin tone. HOW MANY TREATMENTS DO I REQUIRE? WHAT RESULTS SHOULD I EXPECT? Average 6-12 sessions (4 weeks apart) are required for the treatment to give full results including lightening of tone, removal of spots and a youthful skin. IS CARBON Q-SWITCH BEST LASER FOR GLOW? Carbon Q-laser facial is a revolutionary laser treatment. We apply carbon thin layer for 10 minutes on the face followed by laser. Laser then triggers the generation of new skin cells making the skin look fairer & healthier. WHAT ARE THE KEY BENEFITS OF CARBON Q-FACIAL/LASER FACIAL?